The first curved smartphone to make it out of Asia, the LG G Flex is now available as a Rogers exclusive in Canada. It is going for as little as $199.99 on a two-year agreement 0r $649.99 on a month-to-month. Rogers, Canada’s largest carrier and fastest LTE network, has snagged many devices, such as the Moto X, as an exclusive among the carriers in Canada. It will be interesting to see how many customers are excited or at least curious enough about owning a curved LG G Flex smartphone. 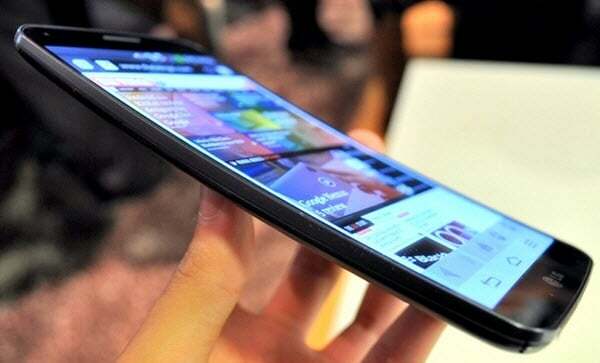 You can read our complete review on the LG G Flex and see how it compares to the regular LG G2. The G Flex is curved from top to bottom so it easily contours to your face or in your hip pocket it will follow the curve of your – well you know what I mean – and if you turn it to the landscape position, the screen is curved like the huge TVs for an interesting perspective. The other interesting feature is the ‘self-healing’ back of the device – yes your read that correctly – if you get a scratch or dent the back, it is supposed to ‘heal’ itself. Alex’s review of the device does show it to work to some extent, but still has a way to go – but definitely a great idea. The LG G Flex is basically the LG G2, but with a larger, curved POLED display instead of the G2’s IPS display and comes with a larger battery – 3500mAh vs the 3000mAh in the G2. The screen is a larger, 6-inches compared to the LG’s 5.2-inch display and another big difference is the original G2 has a Full HD 1080p display whereas the G Flex falls back to an HD display of 720p resolution. Both are using the Qualcomm Snapdragon quad-core 800 processor clocked at 2.26 (2.3) GHz with 2GB and 32GB of internal storage. The main camera excels at 13MP and a 2MP for the front-facing camera (FFC) for video chatting and selfies. It does arrive with only 4.2.2 Jelly Bean, so hopefully LG is preparing the Android 4.4.2 KitKat update for the G Flex very soon. Please let us know on our Google+ Page if you will be picking up the LG G Flex on Rogers and do you like the idea of the curved display or do your prefer typical flat displays – please hit us up, we would love to hear from you. 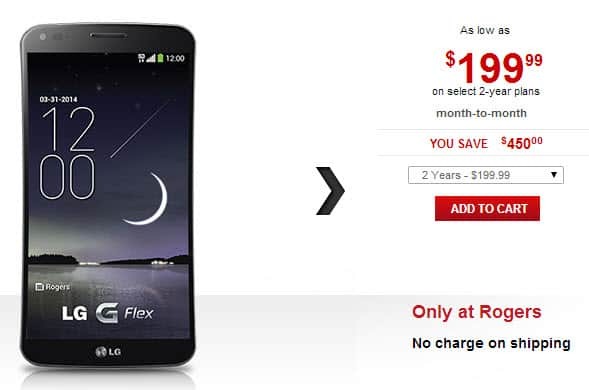 The post Rogers Now is Offering Their Exclusive LG G Flex appeared first on AndroidHeadlines.com |.